Last week, Melinda Weekes and I participated in the Presencing Institute’s Global Presencing Forum. It was an excellent experience at the edge of social innovation. It was great to be in the presence of Otto Scharmer and Peter Senge (see Scharmer’s reflections here). And even better to in the company of a global community of people seeking to advance social technologies that can actually address the challenges we face. We are all pare of larger systems in which we collectively create results that nobody wants. Wow! Ponder that! 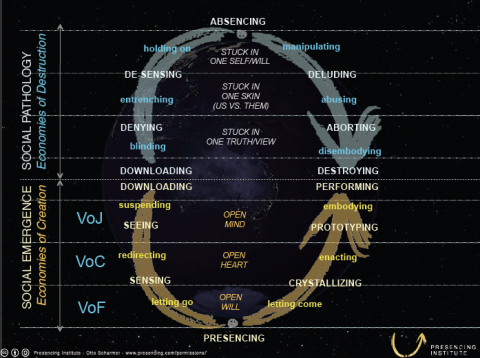 Otto articulates a series of evolutionary shifts, moves from what he calls our 2.0 and 3.0 responses to what now are 4.0 problems. In a field where we are continually beset by the constraints of silo structures and silo thinking, he talks about shifting from silos to “connective intelligence.” This is a specially useful play on our calls for collective intelligence. The good news is that today we have the technology that can facilitate such a shift. The image above speaks to Otto’s proposition that we live in two different social fields – the field of presencing and the field of absencing. We oscillate between these two. What would it mean to hold this fact in our awareness? I’m considering using a simplified version of this image and placing it in front of the room when I’m facilitating. I want to invite participants to continually sense where they are coming from as a process moves forward. We spent a lot of time in our bodies, guided by the masterful Arawana Hayashi. We were vividly reminded that the answers that we are looking for are not to be found in our heads. I specially appreciated being part of a breakout session on “Advanced Approaches to Systems Change,” and to experience the boldness with which people experimented with dipping into the “U.” I loved the experimental nature of the forum and my own realization that this work is all so new that all of us doing it are amateur innovators, pioneers of the future that wants to emerge. Can’t wait to hear more. This is so related to yesterday’s post–in the following way. Systems of oppression exist and produce results that no one really wants. And, it’s challenging to interrupt those dynamics without producing other things that we also don’t want! Thanks for your reflections! Something else that Otto Said in his intro was about Theory U’s core assumption that “the quality of results is a function of the quality of awareness” Which tells me that there is an evolutionary leap that is required here, a profound shift in how we attend to the world we live in – including how we look at the problems we are trying to solve.